One of the biggest lessons we’ve learned within the world of pricing is that even though your price remains the lever that has the highest impact on your revenue, the subject is one of the most sensitive topics in a business. This shouldn’t come as too much of a surprise. After all, a price is a reflection of all the creativity, efficiency, and value that a business creates, a number that is then buttressed by the marketing department, sales, product teams, and the like. With so many stakeholders who approach pricing from multiple different angles, of course the discussion will sit lightly upon the precipice between collaboration and an all out brawl. Well, at least that’s what happens in a pragmatic organization. In businesses that suffer from a lack of momentum, all of the pricing data in the world wouldn’t matter, as indecisiveness leads to leaving a pricing strategy to atrophy under the weight of being overwhelmed by such an important decision within a business. At the speed at which business moves in the 21st century, you cannot afford to let your pricing strategy atrophy or become a debilitating battle. The stakes are too high. The amount of cash you’re leaving on the table is too much. Instead, we’re a strong advocate of approaching your pricing strategy as a process. You already have processes for customer acquisition, product development, and even bookkeeping. It’s time the most important number in your business has a process too, because nothing, absolutely nothing, has a greater impact on the only cell in the spreadsheet that matters every month. For years, pricing has been this ominous beast that businesses wait to tame until they can afford a “pricing team” or “pricing consultants.” We think that’s poppycock. Pricing is the last thing that should be locked up in an ivory tower. Instead, look at your pricing strategy as a way to eliminate as much doubt as possible. The metaphor we like to use is a dartboard. In the game of darts you’re not always trying to get a bullseye. Instead, sometimes you’re focused on specific panels or points. Similarly, your pricing strategy is working to find the best point on the board, out of all the other points, to sustain your business and capture as much cash from the table amongst your target customers. For most, the traditional pricing strategy involves purely focusing on everything that supports the dartboard: marketing, sales, product development, finance, etc. When it comes time to pick a point on the board, the management team gets in a room, agonizes about what the best point should be, and more often than not, simply tosses the dart and picks the point where it lands. In other words, a lot of smart people are simply just guessing, because they have no data to tell them where to go on the board. What’s surprising is that this strategy does work, because with a halfway decent product, some good marketing, and a sales strategy someone out there will buy your product and, therefore, validate that price. Of course, this isn’t the best strategy for maximizing revenue or boosting profit. As such, your pricing strategy must eliminate as much doubt as possible. Think about it as a way to eliminate sections of the dartboard, focusing in on the right region for your dart to land. 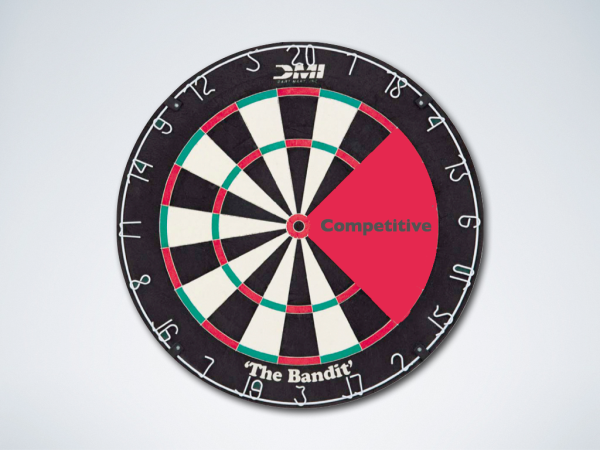 When you go to business school they teach you there are three tactics to paring the dartboard down: focusing on the customer, competitors, and costs. Cost based pricing is fairly self explanatory. You do everything you can to calculate every cost you have for producing a product or a service, and then you assign a margin on top of those costs. We’ll go through cost-plus pricing more extensively in another post, but utilizing your cost data, you at least know what region of the dartboard you need to be on to sustain your business. Of course, you’re still guessing on the margin you’re putting on top of the costs, but more data is better than less in the pricing process. Once again, this pricing tactic is fairly self explanatory. You stack all of your competitors on a totem pole and decide where on the pole you sit, setting your prices accordingly. For most businesses, competitor based pricing is a step up from cost-plus pricing, because there are more external data indicators to guide the pricing process. You’re still guessing though with competitor based pricing, because most products are not completely congruent. Comparing a specific vacuum cleaner to a dozen different vendors gives you a fairly accurate view of the market, but comparing automated testing software muddies the waters, because feature lists are not the same. Plus, measuring brand power or how much a brand is worth is exceptionally difficult when comparing products. The coup de grâce of pricing focuses directly on the willingness to pay of the customer. Through different value models you utilize survey input, data crunching, and the like to determine what target customers are willing to put down for your product. Experts and intuition say that this is the best way to price, because you’re relying on customer input. Of course, getting to the customer’s willingness to pay is not the easiest thing to do, which is why most people go down river to competitor, cost, or guess based pricing. Keep in mind too, this isn’t a silver bullet that spits out one single price for you to throw on your pricing page. Most value models spit out a range that still forces you to make a decision. Yes, the range may be “$100 - $130” or “$10 - $15”, which, of course, makes the decision much easier. The BIG thing to keep in mind here is that these tactics don’t need to be (and shouldn’t be) mutually exclusive. You will get to your customer’s true willingness to pay through value-based pricing, but you need to keep those numbers in context of your costs and your competitors. More often than not, discrepancies between the different data points will reveal that you’re seeking a different customer segment or marketing to the wrong one, but the data allows you to guide your pricing and business as a whole. Additionally, you very well may find that you’re building the wrong product, marketing the wrong value propositions, or even selling the wrong revenue model. All of these factors influence your price and a customer’s willingness to pay influences these factors. It’s a process. Treat it like one. Just be sure to use data and a consistent strategy for evaluation. 1. Assign key stakeholders and a deadline: One person should be in charge of the final pricing decisions. A million people can lay the groundwork for the decision. A million more can counsel and collaborate on the decision. Yet, one person should make the final say within a given time period. If you don’t, then it’s too easy for your pricing strategy to atrophy and become swept up in bureaucracy and procrastination. 2. Data, Data, Data: In other parts of business, I’m comfortable saying we sometimes have too much data and suffer from the infamous analysis paralysis. In pricing, we’re far from this phenomenon creeping up. Therefore, grab all the data you can get your hands on. I doubt it will be a significant amount, and each data point will reduce the area of the dartboard. Remember, we’re trying to eliminate as much doubt as possible, as opposed to pinpointing the perfect price. 3. Do it Yourself: Traditionally, businesses flock to expensive pricing consultants who do a phenomenal job and then leave you until you revisit pricing in 6-12 months. Others can’t afford consultants or to have one person strictly in charge of pricing. Both of these approaches eliminate the intimacy you need to have with the value and price of your products, making it an outsourced ordeal. Instead, make the conversation a regular occurrence and the data collection and research at least 25% of one person’s job. The insights you find will have astronomically more impact. 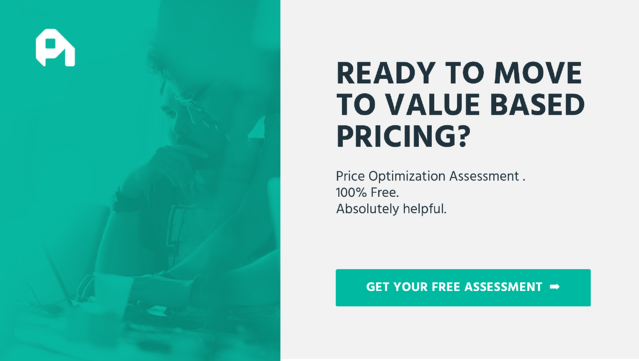 At Price Intelligently, we focus on providing solutions for you to complete value-based pricing studies on your own. Our technology is based on a scientifically proven methodology developed by a famous Dutch Economist named Van Westendorp who wanted to come up with an elegant and relatively low-cost method to figuring out a customer’s willingness to pay. Other value-based pricing models either required an extensive amount of data or went about collecting data in a qualitative manner. For instance, some methods worked by directly asking customers how much they’d be willing to pay for a product. Yet, asking directly leads to one data point and a lack of knowledge concerning if that one price is an overestimate or an underestimate. Other models involved asking a customer about a series of different prices and if they’d be willing to pay. Unfortunately, customers figured out what was going on and would just say “no” to everything. To combat as much survey bias as possible, VW came up with a method to ask in ranges, because he knew responses would be much more accurate and customers would be much more willing to answer. Here’s an example of a VW pricing campaign. The result over a statistically significant sample size is a value based pricing range that allows you to know exactly what a customer segment is thinking in terms of price. We’ve made it easy to administer and easy to interpret. 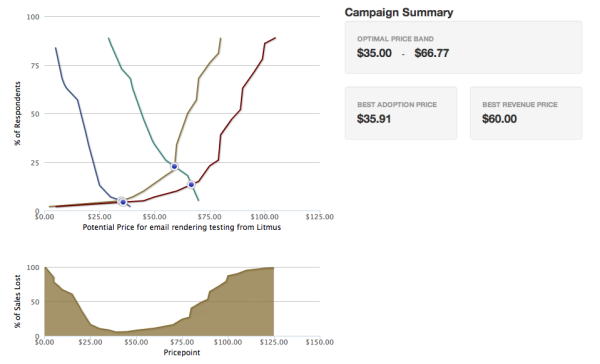 A few months back, a potential customer and a local VC both asked us, “Well, the theory makes sense, but how do I know you’re finding the ‘right’ price?” Our response was to look at a product where the price was completely demand driven - a commodity. We chose gold, and I’m proud to say our technology worked swimmingly. We ran a pricing campaign that surveyed 37 different gold buyers throughout the United States on their willingness to pay for 1 Troy Ounce of Gold. The price of gold on June 14, 2012 was $1613.50 and our software came back with an optimal price band of $1505.10 - $1515.32. Wait a minute. Those two numbers don’t match, do they? Well, in addition to asking the pricing questions, we also asked what margin they sought as a business. After all, the gold buyer is trying to make some cash, as well. The average margin was 6.5%, bringing our optimal price range up to $1610 - $1621, nicely enveloping the final spot price of gold for the day. I'll write those four words until the cows come home. I cannot stress enough how important optimizing your pricing is to the success of your business, because no other lever will have more of an impact on your revenue from month to month. Get off the sidelines and fight the atrophy that plagues the majority of businesses out there. You've taken the first step by checking out this post. Check out more of our resources, including our Pricing Strategy ebook, and let us know if you'd love to chat about pricing. We even offer free price optimization assesments. We geek out about this stuff and want to help you in any way possible.